The Stratosphere Casino Hotel and Tower offers a plethora of nightlife and daytime things to do. The Top of the World Lounge was turned into the stylish lounge experience called Romance at Top of the World. The lounge features elegant décor, bottle service, upscale drinks and unsurpassed views of Las Vegas. "Romance at Top of the World says it all. 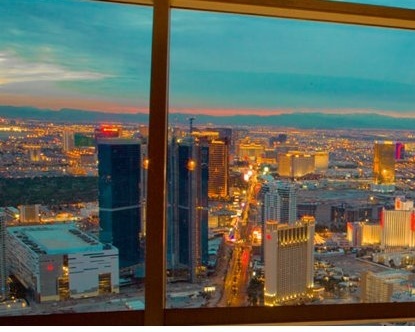 Everything about the venue is designed to give our guests from around the world the ultimate romantic lounge experience", says the vice president of food and beverage for the Stratosphere Casino Hotel and Tower. The primary color throughout the room is a deep burgundy that is accentuated with subdued lighting and candles. The bar features a glass top illuminated with fiber optics. There are 12 VIP sections that face either the Las Vegas Strip or surrounding areas. Each section contains luxury couches enclosed for privacy or bottle service that can be reserved for any occasion. Romance at Top of the World upscale beverages include almost 30 martinis along with The Top of the World Martini ( hennessy Paradis, Grand mariner and Ultimat CV Vodka, shaken, not stirred) for $100 as the signature drink. Other selected beverages include ports, scotches, bourbons, fine wines and dessert wines. 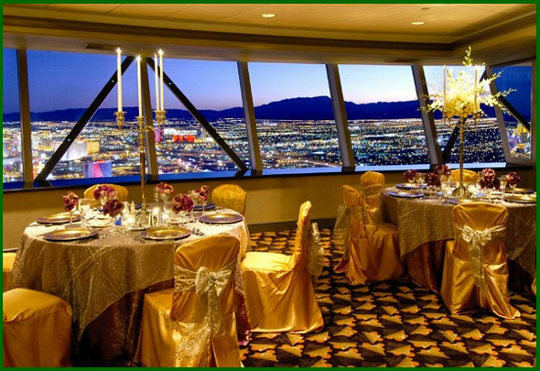 Romance at Top of the World is located on Level 107 of the Stratosphere Casino Hotel and Tower.